However, there is no evidence that this is the case with the MOOV range of head lice treatments as they do not contain synthetic chemical pesticides. The active in MOOV Head Lice Solution is eucalyptus oil. Once the product is washed out from the hair, any residual eucalyptus oil evaporates from the hair very quickly. This does not allow for resistance to develop in head lice. 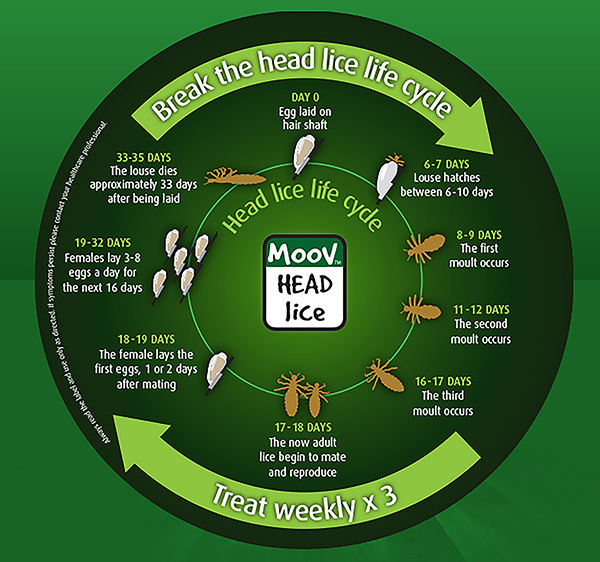 In just three simple applications, each seven days apart, the combination of natural essential oils in MOOV Solution interfere with the biochemical mechanisms of the head lice causing death, killing both the head lice and their eggs, and breaking the life cycle. • Uses a powerful blend of essential oils rather than chemical pesticides. • The MOOV Solution is also pleasant-smelling and easy to use and only has a 10 minute treatment time. It also comes with re-useable shower cap. It has been clinically proven** to work- giving you piece of mind. Also in the MOOV range is the MOOV Head Lice Combing Conditioner, the NEW MOOV Shampoo and the MOOV Defence Spray. An easy to use, effective head lice treatment, Moov Head Lice Shampoo is clinically proven to kill head lice. Unlike our other head lice treatment products there’s no need to shampoo hair after treatment. Simply apply to dry hair, cover with reusable shower cap, leave for 15 minutes and then rinse out like a normal shampoo. It has a gentle foaming action like an everyday shampoo and leaves the hair feeling soft and smooth. MOOV Head Lice Combing Conditioner can be used alone to help detect the presence of head lice and eggs, or in conjunction with MOOV Head Lice Solution. The Combing Conditioner also makes it easy to remove head lice and eggs from the hair after the use of MOOV Head Lice Solution. • Eucalyptus oil improves the stun effect of the conditioner on lice. • Pleasant-smelling and easy to use. • Comes with metal-toothed head lice removal comb. Defend your kids against head lice. MOOV Head Lice Defence Spray is applied as a leave in conditioner and is sprayed onto hair daily for defence against head lice over an eight hour period. The spray makes hair unpleasant to lice, whilst conditioning the hair. **Clinically tested in Australia (2004) by Uniquest to ICH GCP Standard. (International Conference on Harmonisation Good Clinical Practice). Once the female lays her eggs, these eggs will hatch and the lice mature into adults that are ready to breed in just over two weeks. That is why it is necessary to treat hair at day 0, 7 and 14. See life cycle above. It is important to treat a head lice infestation immediately.